Regular visitors to this blog will bear with me I am sure when as I am doing today, I deviate from the world of comics and fantasy art in general to talk of matters which affect us all. 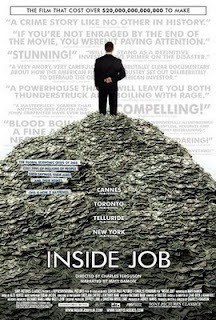 I am not going to bore you with too much introductory blather, but for people like myself who have been completely pissed off and disaffected with the under-reporting of the world's biggest ever financial deceit as it slowly unfolded over the last ten years, Charles Ferguson's film, Inside Job is an absolutely essential piece of viewing. This documentary is brilliantly conceived, Ferguson's technique being to simply allow the power brokers at the heart of this disaster to talk and what they have to say is a devastating indictment of the greed and hubris of a group of people who have literally become a law unto themselves, whilst lesser mortals have to pick up the tab. Here is a link to the film on YouTube, which I suspect won't be around for much longer. But this film is available via Netflix or LoveFilm or via Amazon as either a DVD or online rental. Buy it and watch it and pass it on. And as regards U.K. TV which used to be the envy of the world (or so the BBC still regards itself), here is the sort of reporting they could have been doing a few years ago, it might have at least forewarned savers about where not to locate their hard earned pension funds. Now bear in mind this aired in August of 2007. There's plenty more financially prescient journalism from Max Keiser, to be accessed via YouTube and the web in general. Did you know you can shorten your long urls with LinkShrink and get dollars for every click on your shortened links. Commando - A Birthday Looms.